It will be necessary, for several reasons, to give this short sketch the form rather of a critical essay than of a biography. The data for a life of Nathaniel Hawthorne are the reverse of copious, and even if they were abundant they would serve but in a limited measure the purpose of the biographer. 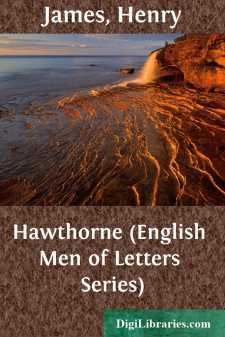 Hawthorne's career was probably as tranquil and uneventful a one as ever fell to the lot of a man of letters; it was almost strikingly deficient in incident, in what may be called the dramatic quality. Few men of equal genius and of equal eminence can have led on the whole a simpler life. His six volumes of Note-Books illustrate this simplicity; they are a sort of monument to an unagitated fortune. Hawthorne's career had few vicissitudes or variations; it was passed for the most part in a small and homogeneous society, in a provincial, rural community; it had few perceptible points of contact with what is called the world, with public events, with the manners of his time, even with the life of his neighbours. Its literary incidents are not numerous. He produced, in quantity, but little. His works consist of four novels and the fragment of another, five volumes of short tales, a collection of sketches, and a couple of story-books for children. And yet some account of the man and the writer is well worth giving. Whatever may have been Hawthorne's private lot, he has the importance of being the most beautiful and most eminent representative of a literature. The importance of the literature may be questioned, but at any rate, in the field of letters, Hawthorne is the most valuable example of the American genius. That genius has not, as a whole, been literary; but Hawthorne was on his limited scale a master of expression. He is the writer to whom his countrymen most confidently point when they wish to make a claim to have enriched the mother-tongue, and, judging from present appearances, he will long occupy this honourable position. If there is something very fortunate for him in the way that he borrows an added relief from the absence of competitors in his own line and from the general flatness of the literary field that surrounds him, there is also, to a spectator, something almost touching in his situation. He was so modest and delicate a genius that we may fancy him appealing from the lonely honour of a representative attitude—perceiving a painful incongruity between his imponderable literary baggage and the large conditions of American life. Hawthorne on the one side is so subtle and slender and unpretending, and the American world on the other is so vast and various and substantial, that it might seem to the author of The Scarlet Letter and the Mosses from an Old Manse, that we render him a poor service in contrasting his proportions with those of a great civilization. But our author must accept the awkward as well as the graceful side of his fame; for he has the advantage of pointing a valuable moral. This moral is that the flower of art blooms only where the soil is deep, that it takes a great deal of history to produce a little literature, that it needs a complex social machinery to set a writer in motion. American civilization has hitherto had other things to do than to produce flowers, and before giving birth to writers it has wisely occupied itself with providing something for them to write about. Three or four beautiful talents of trans-Atlantic growth are the sum of what the world usually recognises, and in this modest nosegay the genius of Hawthorne is admitted to have the rarest and sweetest fragrance.